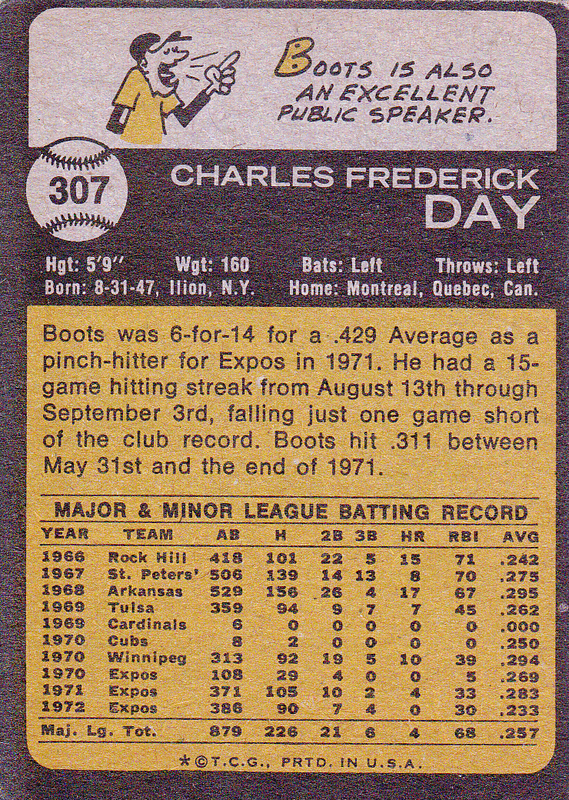 Charles Frederick “Boots” Day(born August 31, 1947) is a retired American professional baseball outfielder. A native of Ilion, New York, Day played Major League Baseball for all or parts of six seasons (1969–74), with the bulk of that time spent with the Montreal Expos. He threw and batted left-handed, stood 5 feet 9 inches tall and weighed 160 pounds. Day originally signed with the St. Louis Cardinals in 1966, and received a Major League trial with the Cardinals in 1969, playing in 11 games and going hitless in six at bats. At the close of the season, he was traded to the Chicago Cubs for left-handed pitcher Rich Nye. He made the Cubs’ opening day 1970 roster, but was soon traded again, in May, to Montreal for veteran catcher Jack Hiatt. After further seasoning in Triple-A, at Buffalo and Winnipeg, he was recalled by the Expos and played the next three-plus seasons as Montreal’s platoon center fielder. In 1971, his best Major League campaign, he reached career highs in hits (105), home runs (4), runs batted in (33), and batting average (.283) in 122 games played. After slumping in 1972, he returned to form the following season, batting .275 in 101 games in 1973. But the Expos acquired veteran center fielder Willie Davis in an offseason blockbuster trade with the Los Angeles Dodgers, and Day lost his semi-regular job. 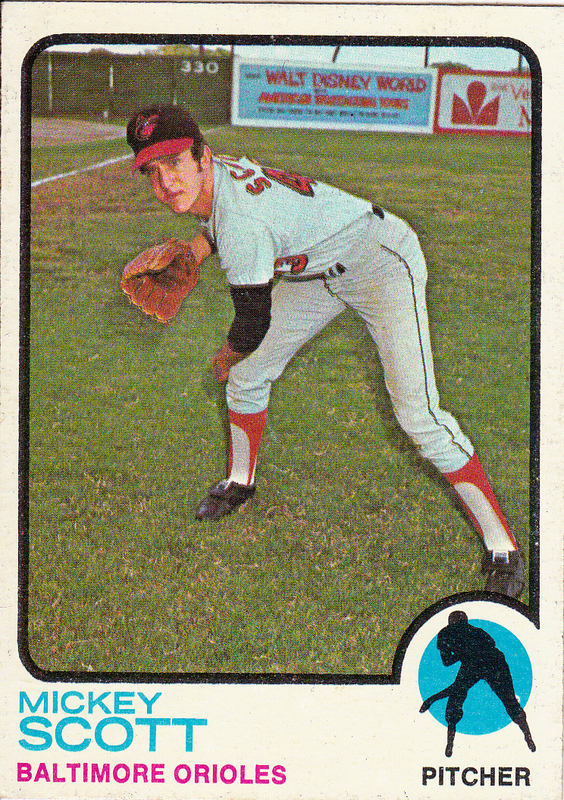 After only 52 games and 72 at bats in 1974, he returned to the minor leagues for the remainder of his playing career. 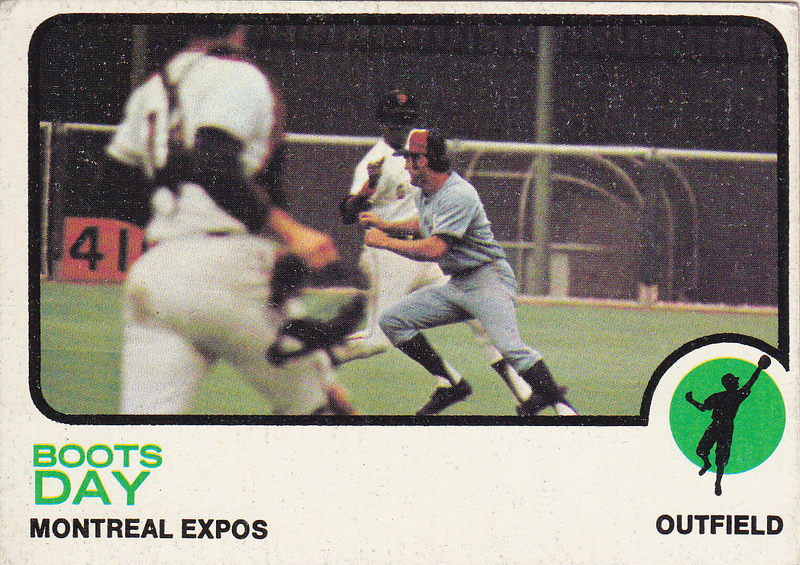 Posted in 1973, 1973 Topps, Expos, Montreal Expos, Outfield. Bookmark the permalink. 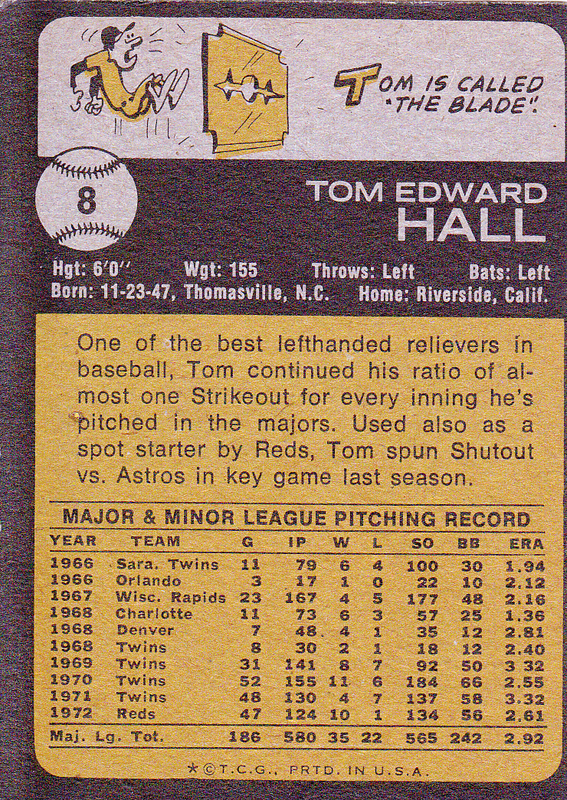 Thomas Edward Hall(born November 23, 1947 in Thomasville, North Carolina), is a retired American professional baseball player, a left-handed pitcher who played in the Major Leagues from 1968 to 1977. Listed at 6 feet tall and 150 pounds, he was nicknamed “The Blade” for his slender physique. Hall played for the Minnesota Twins, Cincinnati Reds, New York Mets, and Kansas City Royals during his Major League career. He was with the Reds during their early years as the “Big Red Machine”, during which time they won 2 National League Western Division championships and one National League pennant. Hall made his final Major League appearance on May 21, 1977, with the Royals. He had a career record of 52-33 with 32 saves. 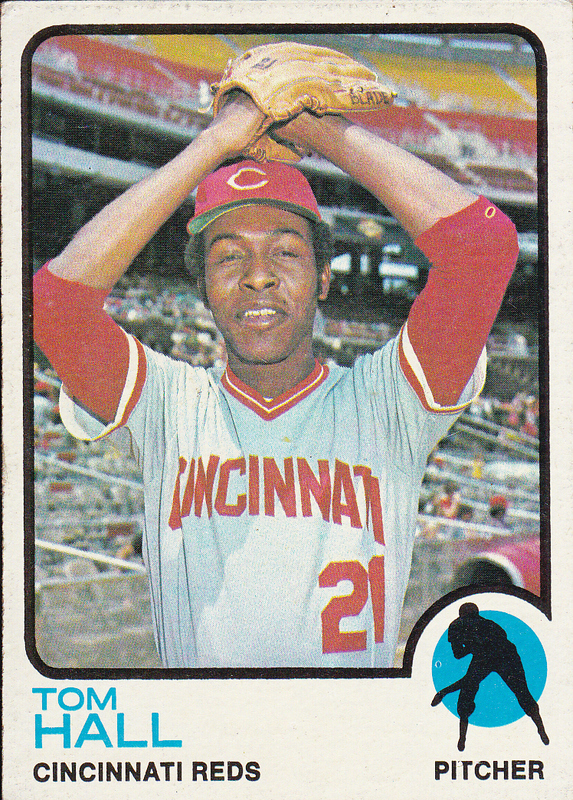 Posted in 1973, 1973 Topps, Cincinnati Reds, Pitcher, Reds. Bookmark the permalink. Jerry Ray Lucas(born March 30, 1940) was a basketball player from the 1950s to the 1970s, and is now a memory education expert. In 1996, the NBA’s 50th anniversary, he was named one of the 50 greatest players in National Basketball Association history. He was named to Sports Illustrated’s five-man College All-Century Team in 1999. Lucas was born in Middletown, Ohio, then a community of 30,000+ halfway between Dayton and Cincinnati, that in the 1940s and 1950s boasted one of the most respected high school basketball programs in the United States. Greatly encouraged, Lucas began pouring hours each day into the town’s game during his early teens. Lucas had become a local playground legend by age 15, in Sunset Park. Sunset Park was then a regional summer hotbed for high school, college and even some pro players. Future Cincinnati Royals teammates Wayne Embry and Oscar Robertson were visitors there. Lucas was already at almost his full-grown height of 6 ft 8 in by age 15, out-playing college players with his advanced game. With no real model to look up to for his game, Lucas simply utilized his rare 20-10 eyesight and remarkable hands to train his shooting and rebounding to remarkable degrees. He created his own drills, showing a gift for inventing games he would utilize later as well. Posted in '72-'73 Topps, Basketball, Center, New York Knicks. Bookmark the permalink. 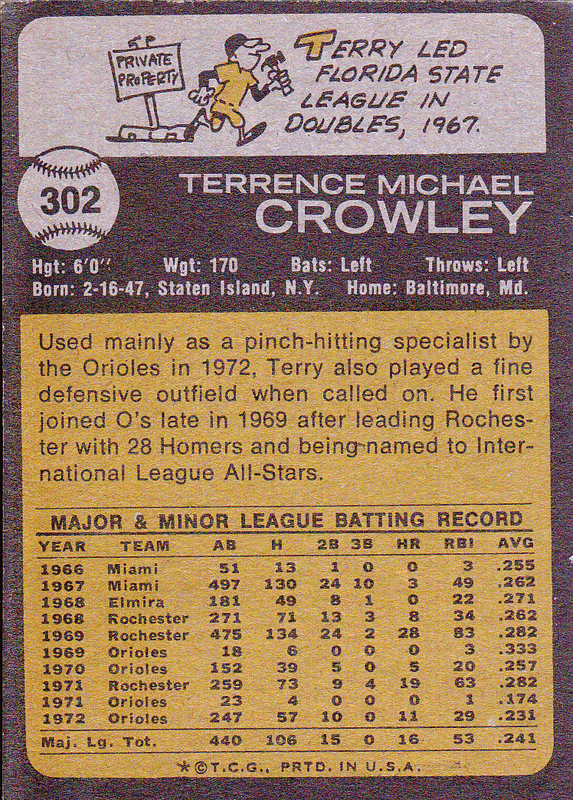 Terrence Michael Crowley(born February 16, 1947 in Staten Island, New York) is a former Major League Baseball player who now serves as the interim bullpen coach for the Baltimore Orioles. Crowley played for the Orioles from 1969–1973 and 1976–1982. He was a backup player that could play the outfield and first base. When the designated hitter rule was implemented, he was the first Oriole to fulfill this role. However, he was best known during his playing career for being a pinch hitter. As of the end of 2008, Crowley’s 108 career pinch-hits is still the 13th-most all-time, tied with Denny Walling. Crowley has served as the hitting coach for the Baltimore Orioles from 1985 through 1988, the Minnesota Twins from 1991 through 1998, and the Baltimore Orioles from 1999 through 2010. Crowley served as a roving hitting instructor in the Orioles organization in 2011. He is now the interim bullpen coach, following Mark Connor’s resignation and the subsequent promotion of bullpen coach Rick Adair. Crowley attended Long Island University, Brooklyn Campus, before being drafted by the Orioles in 1966. 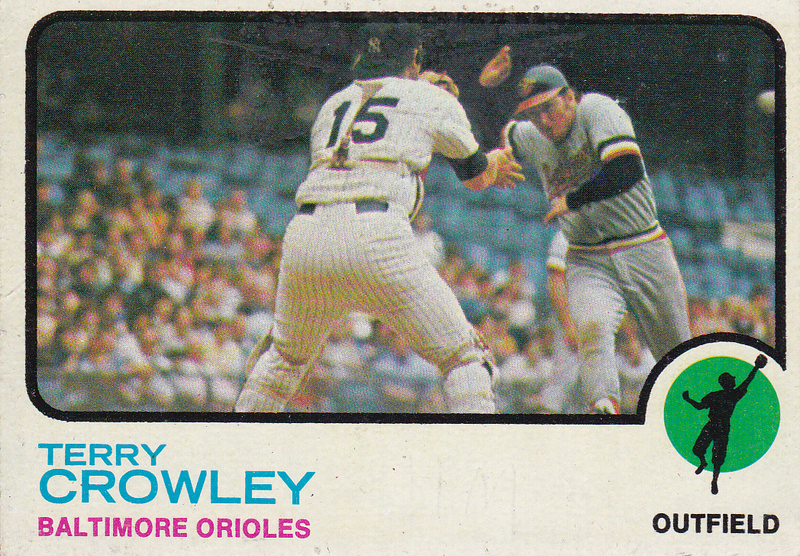 Posted in 1973, 1973 Topps, Baltimore Orioles, Orioles, Outfield. Bookmark the permalink. 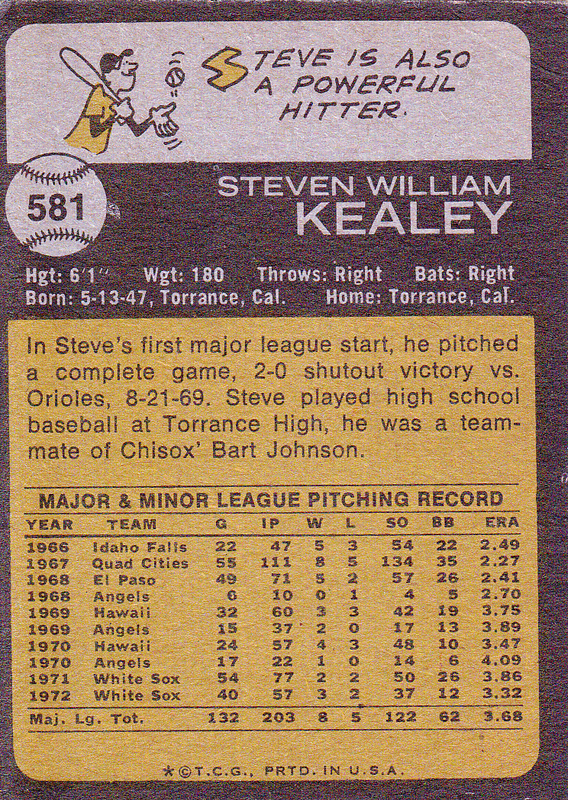 Steven William Kealey(born May 13, 1947 in Torrance, California) was a Major League Baseball pitcher for the California Angels and Chicago White Sox from 1968 to 1973. Kealey had been the most recent White Sox pitcher to hit a home run in a game until Jon Garland hit one in a game against the Cincinnati Reds on June 18, 2006. The 6 ft, 185 lb Kealey appeared in 139 Major League games, four as a starting pitcher. He had one complete game, one shutout, 11 saves and 126 strikeouts in 214⅓ innings pitched, allowing 219 hits and 69 bases on balls. 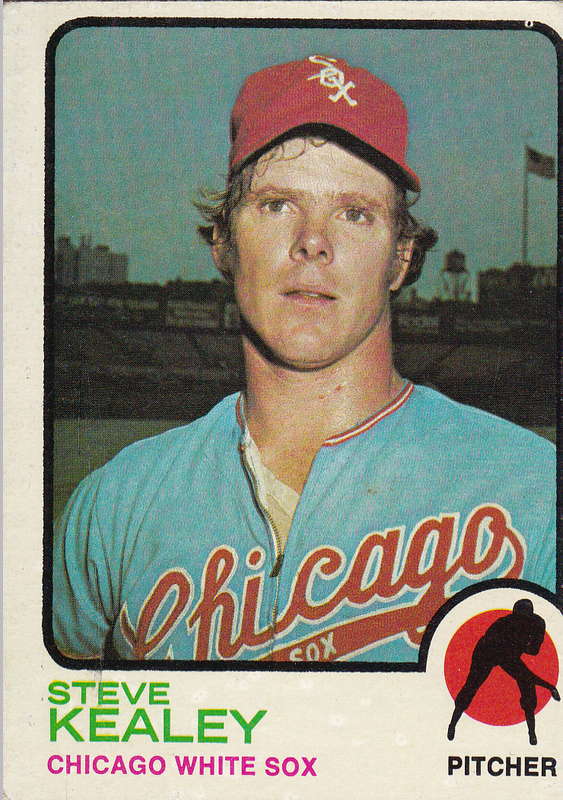 Posted in 1973, 1973 Topps, Chicago White Sox, Pitcher, White Sox. Bookmark the permalink. Ralph Robert Scott(July 25, 1947 – October 30, 2011) was a left-handed specialist pitcher in North American Major League Baseball (MLB) who played in portions of five seasons with the Baltimore Orioles, Montreal Expos and California Angels from 1972 to 1977. He was born in Weimar, East Germany. 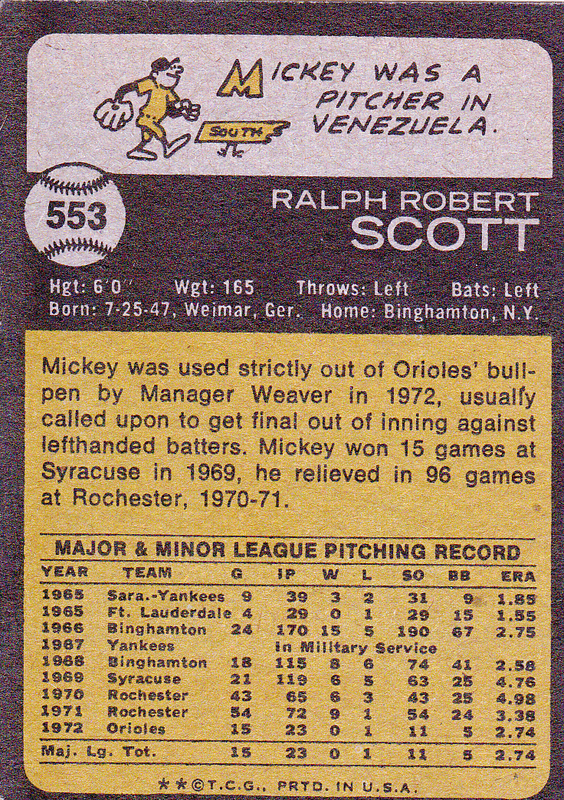 Scott was selected out of Newburgh Free Academy by the New York Yankees in the 17th round of the 1965 Major League Baseball Draft. He was the first high school baseball player drafted out of the Mid-Hudson region of the Hudson Valley by any MLB club. He was traded to the Chicago White Sox for Pete Ward on December 18, 1969. He also spent nine seasons in the Minor leagues, mostly for the Rochester Red Wings of the International League. In 1971, he collected a 9-1 record with nine saves and a 3.38 earned run average in 54 games for manager Joe Altobelli’s pennant-winning and Governor’s Cup winning-team. He had an even better season for Rochester in 1974, when he was 8-2 with 17 saves and a 0.99 ERA in 57 games. In a nine-year minors career, he posted a 60-32 record with 46 saves and a 3.20 ERA in 297 pitching appearances. He was elected to the Red Wings Hall of Fame in 1998, along with Allie Clark, Frank Horton and Al Weber. Scott died in Binghamton, New York, at the age of 64. Posted in 1973, 1973 Topps, Baltimore Orioles, Orioles, Pitcher. Bookmark the permalink. 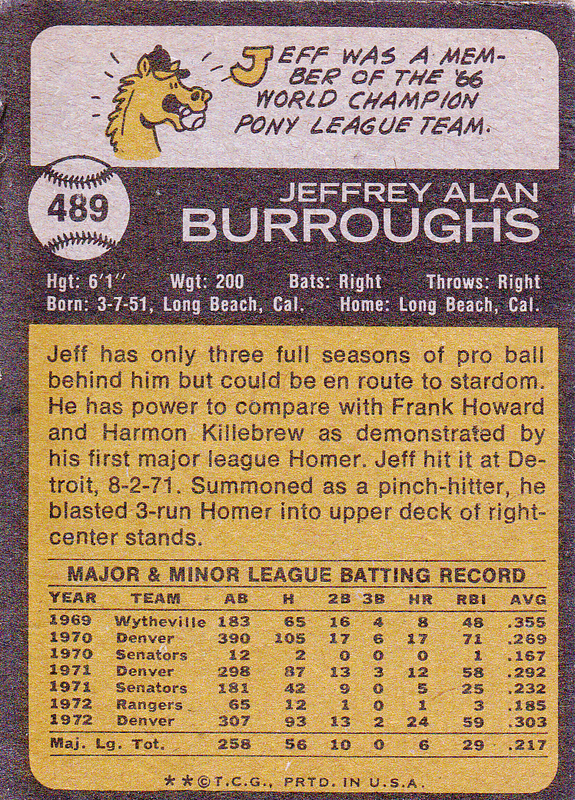 Jeffery Alan “Jeff” Burroughs(born March 7, 1951 in Long Beach, California) is a former player in Major League Baseball. From 1970 through 1985, he played for the Washington Senators (1970–71), Texas Rangers (1972–76), Atlanta Braves (1977–80), Seattle Mariners (1981), Oakland Athletics (1982–84) and Toronto Blue Jays (1985). Burroughs batted and threw right-handed. He is the father of major league third baseman Sean Burroughs. In a 16-season career, Burroughs posted a .261 batting average with 240 home runs and 882 RBIs in 1689 games. 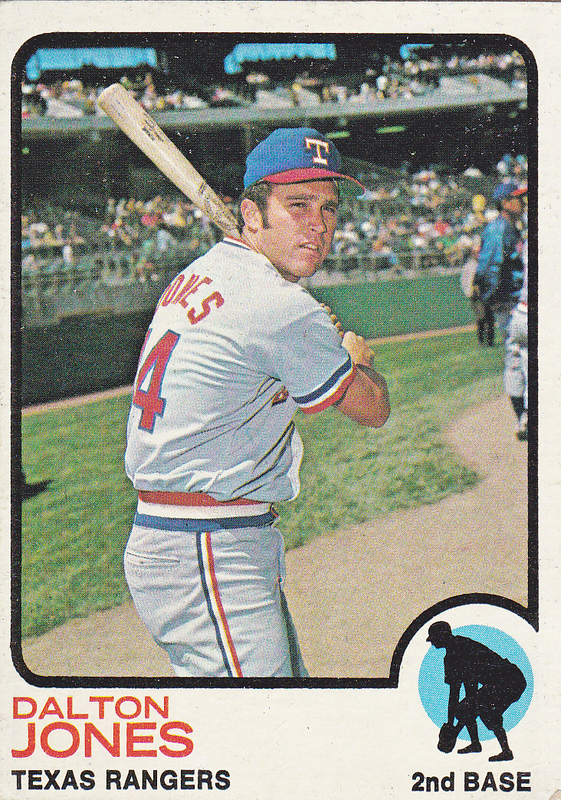 In four full seasons with the Texas Rangers, Burroughs averaged 25.5 home runs a year with a high of 30 homers in 1973. His most productive season came in 1974, when he batted .301 with 25 home runs and a league-leading and career-high 118 RBIs and was selected the American League MVP, making him one of only six overall number-one picks to win the MVP title and the first Ranger to win the award. During the 1974 season, Burroughs was at the center of the violent Ten Cent Beer Night debacle in Cleveland, where Burroughs was one of the targets of thrown objects and a few punches by unruly and inebriated Cleveland fans, in a game that was forfeited to Texas. Late in his career, Burroughs was still a valuable hitter, being used mainly as a DH and pinch hitter. After he retired, Burroughs later coached his son’s Little League team, the Long Beach All-Stars; with Sean as their star player, these teams won the Little League World Series in both 1992 (they actually lost the championship game, but were later awarded the title by forfeit after their opponents were found to have used no fewer than 14 ineligible players) and 1993. 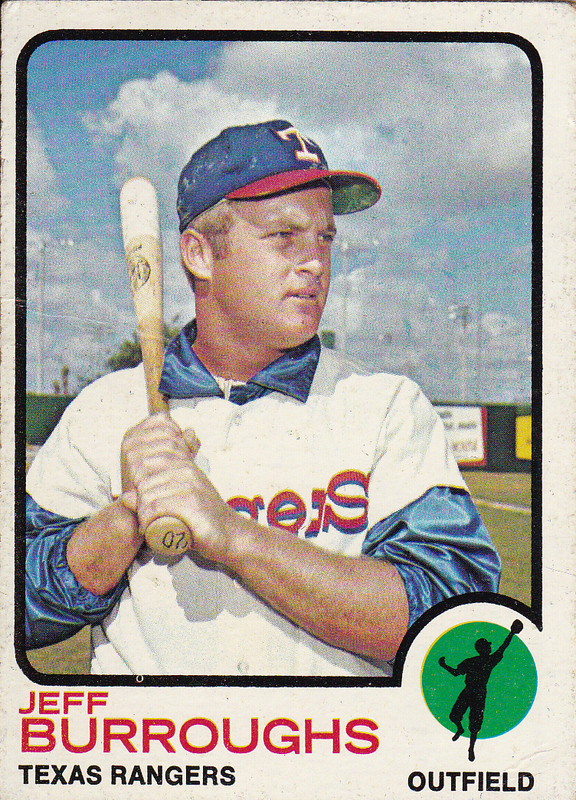 Posted in 1973, 1973 Topps, Outfield, Rangers, Texas Rangers. Bookmark the permalink. Robert Jerry “Bob” Lanier(born September 10, 1948) is a retired American professional basketball player who played for the Detroit Pistons and Milwaukee Bucks of the NBA. Lanier was drafted number one overall by the National Basketball Association’s Detroit Pistons and was named to the All-Rookie Team following the 1970-71 season. He starred for Detroit until being traded to the Milwaukee Bucks in 1980. In his five seasons with the Bucks, they won the division championship each year. The same year he retired, in 1984, he was awarded the Oscar Robertson Leadership Award. In his 14 NBA seasons, Lanier averaged 20.1 points and 10.1 rebounds per game while shooting a respectable 51.4 percent from the field. He played in eight NBA All-Star Games, and was named Most Valuable Player of the 1974 game. Lanier was inducted into the Naismith Memorial Basketball Hall of Fame in 1992 and had his #16 jersey retired by both the Pistons and the Bucks. Posted in '72-'73 Topps, Basketball, Center, Detroit Pistons. Bookmark the permalink. 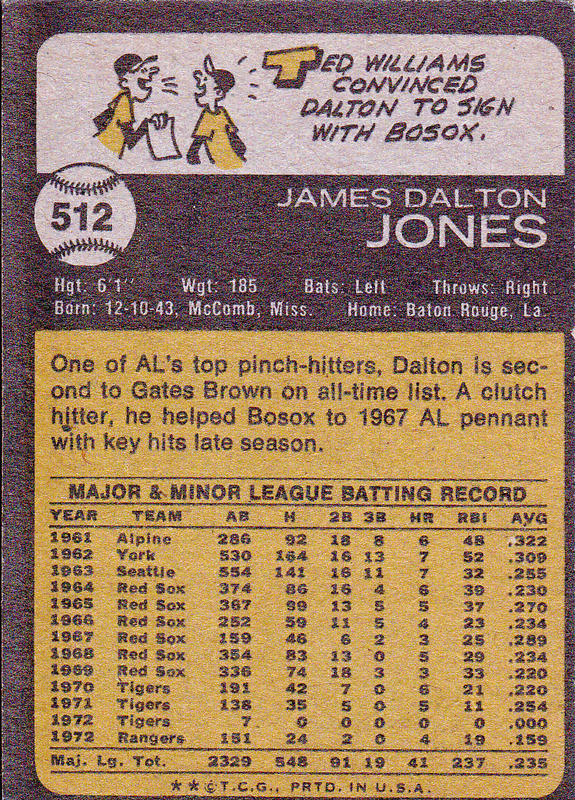 James Dalton Jones(born December 10, 1943) is a former Major League Baseball player who played nine seasons in the big leagues for the Boston Red Sox (1964–1969), Detroit Tigers (1970–1972), and Texas Rangers (1972). Jones was principally a utility infielder and pinch-hitter. He played 262 games at second base, 186 at third base, 158 at 1st base, 18 in the outfield, and 1 at shortstop. In 907 Major League games, he compiled a .235 batting average with 548 hits, 268 runs scored, 237 RBIs, 91 doubles, 19 triples, 41 home runs, and 20 stolen bases. In 1973, Jones played with the Peninsula Whips, the Triple-A team in the Montreal Expos organization. After that effort, Jones realized he wouldn’t be making a comeback and retired from baseball. After his playing career ended, Jones worked for a time at a bank and spent five years working for Exxon. Posted in 1973, 1973 Topps, 2nd Base, Rangers, Second Base, Texas Rangers. Bookmark the permalink. 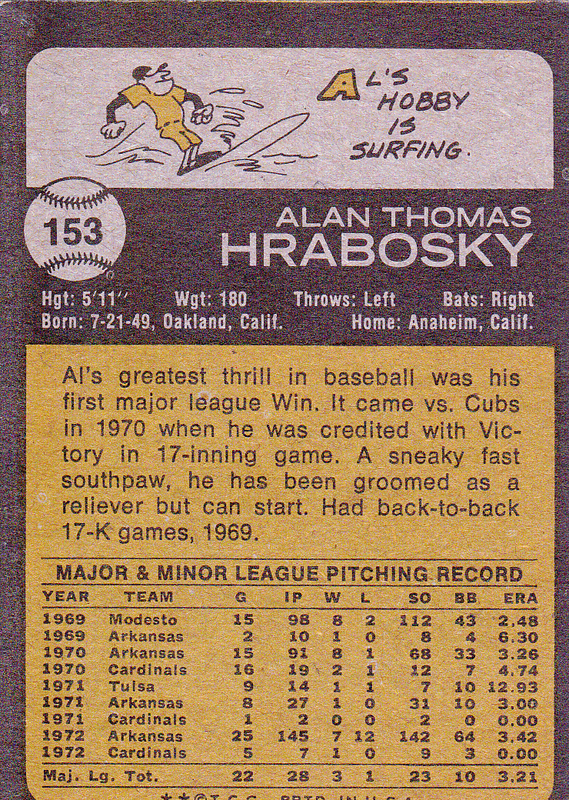 Alan Thomas “Al” Hrabosky(born July 21, 1949) is a former Major League Baseball player from 1970-1982 for the St. Louis Cardinals, Kansas City Royals and Atlanta Braves and is currently the color commentator on Cardinals regular season broadcasts on FSN Midwest. He also owns Al Hrabosky’s Ballpark Saloon, which is located right across the steet from Busch Stadium. Hrabosky’s nickname is The Mad Hungarian because of his unusual last name and colorful character. Hrabosky became a fan favorite for his antics on the mound. Between each pitch he would turn his back to the batter, walk towards second base, vigorously rub the ball between his palms several times, take a deep breath, and pound the ball into his mitt. He would then storm back to the mound, staring down the batter. Although the crowd would roar in delight, most batters were not fond of the pitcher’s routine. Hrabosky’s best year was 1975 when he led the National League in saves with 22 (a career best) en route to winning the Sporting News “NL Fireman of the Year” award. After eight seasons in St. Louis, the Cardinals traded Hrabosky to the Kansas City Royals. Following just two years with the Royals, he was released and signed with the Atlanta Braves. During his time with the Braves he saw diminished playing time and recorded just seven saves over three seasons. Hrabosky signed with the Chicago White Sox during Spring Training in 1983 but retired before the season began. In 13 seasons he recorded 64 wins, 35 losses, and 97 saves with an ERA of 3.10. Early in his career with the Cardinals, Hrabosky enhanced his menacing appearance with long hair, and a Fu Manchu moustache. However, when Vern Rapp became the Cardinals manager in 1977, Hrabosky had to cut his hair and shave the moustache. 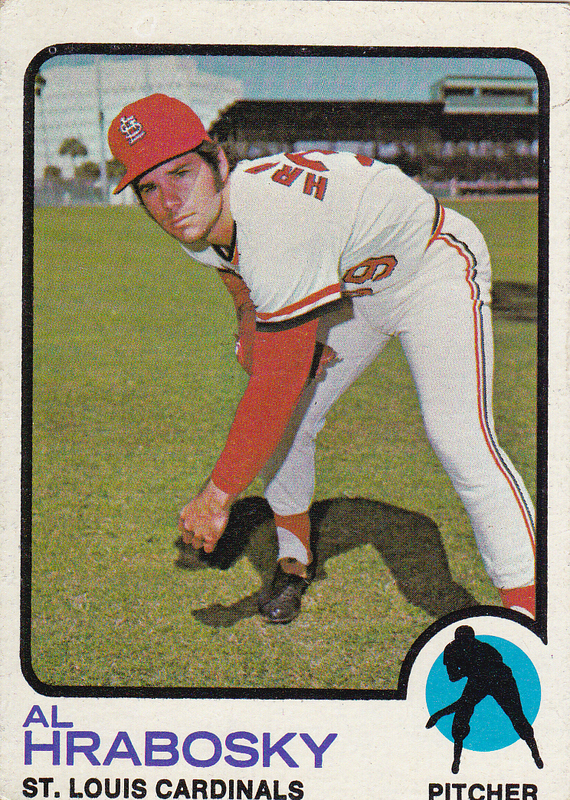 Posted in 1973, 1973 Topps, Cardinals, Pitcher, St. Louis Cardinals. Bookmark the permalink.